What Are Your Chances of Winning a Lemon Lawsuit Against Ford? If you’re reading this article, chances are you have already brought your 2011-2016 Ford Fiesta or your 2012-2016 Ford Focus into the shop at least once for shuddering, hesitating, lacking power, stalling, activation of the “Transmission Overheat” warning light, activation of the “Check Engine” warning light, grinding, jerking, etc., etc. The Ford Focus and Ford Fiesta Lemon lawsuits continue to be our most active cases. Thus far, we have had more than 300 Focus and Fiesta vehicles repurchased due to their defective transmission systems and we are currently in the process of litigating an additional 100 cases involving the exact same issue. If you have taken your 2011-2016 Ford Fiesta or your 2012-2016 Ford Focus to a Ford dealership for a transmission system repair and your clutches and seals and/or transmission control module (TCM) have been replaced at least twice, we can most likely get your vehicle repurchased under the California Lemon Law. A California Lemon Law buyback is NOT the same as the buyback offers you may have received from your local Ford dealership. These buyback offers from Ford dealerships actually have nothing to do with the California Lemon Law and they are not in your best interest. We have been informed by several of our clients that Ford’s dealerships have offered to buy their car back. Unfortunately, the dealerships are actually offering a trade-in with a discount on the new vehicle. There are two problems with this scenario. One, the trade in value on the 2011-2016 Ford Fiesta and the 2012-2016 Ford Focus is low because thousands of consumers are trying to trade them in to get rid of these problematic vehicles. Two, the new 2016 Ford Fiesta and Focus are equipped with the same dual clutch transmission system that the 2011-2015 Fiesta and 2012-2015 Focus already have, so trading the vehicle in for a new 2016 model is trading one problem for another. In a California Lemon Law repurchase, the consumer is entitled to recover their down payment, all of the monthly payments they have made, their current registration fee, all towing and rental car fees, and Ford Motor Company has to pay off the entire balance owed on the auto loan. The only deductions from the refund include the mileage offset which is placed at the mileage on the vehicle at the first transmission system repair, aftermarket items, factory rebates, or negative equity. According to Ford Motor Company, the clutches are on national backorder because the manufacturer cannot keep up with the massive demand. If you take your 2011-2016 Ford Fiesta or 2012-2016 Ford Focus to your local Ford dealership and you are told that you need new clutches and seals, but they are on backorder, make sure that your repair invoice clearly states that the parts have been special ordered for your vehicle. You may even want to try going to a different Ford dealership because some dealerships are getting the new parts more quickly than others, and some dealerships are being less than honest about the wait time. In addition, do not let the dealership keep the repair order open. When they keep the repair order open, they do not give you a copy of your repair invoice, which means you have no proof that any work was performed or any parts were ordered. By law, the dealership has to give you a work order every single time you drop your car off for a repair and they have to give you a completed repair invoice every time you pick your vehicle up after a repair. The most important evidence in a lemon law case is the repair orders and invoices so please keep all of your paperwork in a safe place. In order to move forward with a lemon law claim, you will need to have the actual clutch and/or transmission control module (TCM) replaced. If Ford has reprogrammed the Transmission control module (TCM) and Powertrain control module (PCM) and performed the adaptive relearn procedure to the TCM, Ford does not view this as a “real” repair; it’s just a slight adjustment made for “customer satisfaction.” But these reprogramming repairs are still important in building a lemon law case because in order to win a buyback, we have to prove that your vehicle has a defect, the defect has been subject to an unreasonable number of repair attempts (four or more), and Ford cannot repair the defect. Lastly, we have to prove that the defect substantially impairs your use, value or safety. In order for our firm to obtain a full lemon law repurchase for you, you need to have four or more repair invoices for the transmission system defect and at least two clutch or transmission control module (TCM) replacements. If you are unsure what repairs have been made to your vehicle, call or email us and we can go over the invoices with you. The California Lemon Law is an important tool for consumers who purchase defective vehicles. Your car is the second-largest purchase you will make and is likely your primary means of transportation for getting to your job. Therefore, if you think your 2011-2016 Ford Fiesta or 2012-2016 Ford Focus is a lemon, do not let your local Ford dealership try to convince you that there’s nothing wrong with the car, or take them up on their offer to “buy back” your vehicle. Owners of 2011–2016 Ford Fiesta and the 2012-2016 Ford Focus may be prime candidates for a Lemon Law case. If you believe that your 2011-2016 Ford Fiesta or 2012-2016 Ford Focus is a lemon, call or e-mail us today for a free case evaluation. 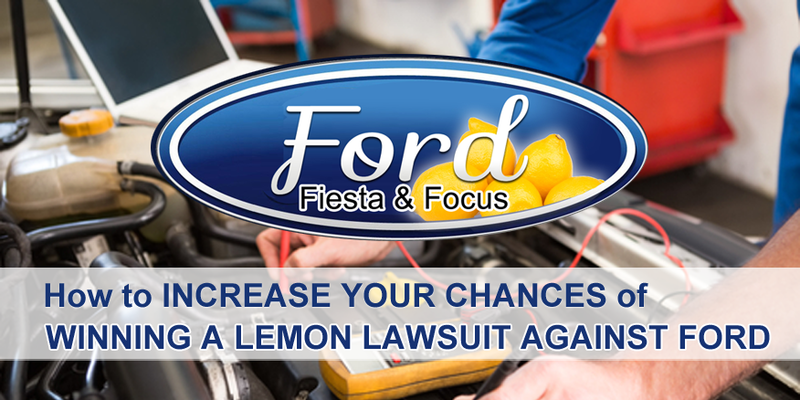 If we can help you with a lemon law case, Ford Motor Company has to pay our legal fees and costs so there is no cost to you.